Description Located in the Eastern Rift Valley of Kenya, Navaisha is recognized for its diverse flora and fauna. This lake provides water for agricultural irrigation within the region and is home to a tourism and recreation industry that focuses on sport fishing. 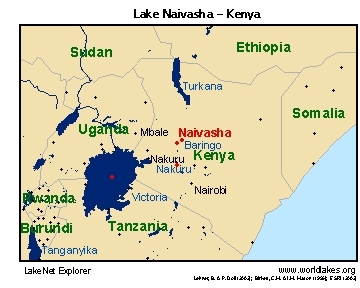 Unlike other Rift Valley lakes, Naivasha is characterized by freshwater which is both ecologically and economically valuable. 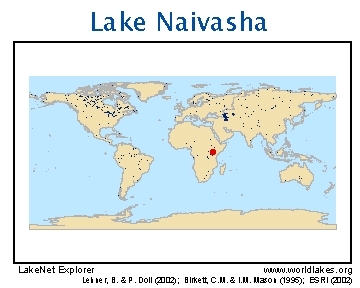 Description Naivasha is a shallow lake basin with no surface outlet and two perrenial inflowing rivers. It experiences seasonal fluctuations in its water levels from a volume of 50,000 cubic km during dry season to 600,000 cubic km in the wetter season. Similarly, surface area of the lake ranges seasonally from 100 sq. km to 150 sq. km. 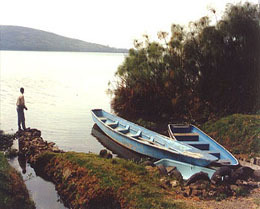 Lake Naivasha is the only freshwater Rift Valley lake within Kenya and therefore supplies water for irrigated agriculture throughout the region. Economic Value Lake Naivasha provides the water for approximately 250,000 people within townships surrounding the lake, including Nakuru and Naivasha . The area surrounding the lake offers a mild climate and natural beauty that has attracted tourists. Tourism provides some income for the area, (nationally, the service sector provides 63% of GDP). Lake Naivasha also supports a productive fishery that provides jobs and income as well as being an important source of protein for local communities. Major Cities Naivasha and Nakuru. The number of people living within 5 km of the lake shore has increased drastically from 50,000 in 1977 to 250,000 in 2001. Description Through the Lake Naivasha Riparian Association, a management plan is in place at Lake Naivasha. The plan was officially adopted in 1997 and includes the concept of sustainable development, wise use of resources and voluntarily adopted sectoral codes of conduct. Issues The greatest threats to Lake Naivasha result from increased water demand throughout the region. A five-fold increase in human population size within 5km of the lakeshore has driven water demand to exceed supply. Out of basin water transfers present a serious threat. Water is currently diverted from the Malewa River inflow to provide for domestic use in Naivasha, Nakuru and surrounding townships. Similarly, general water abstraction from the lake is causing lake levels to fall, despite the natural tendency to rise 4cm/year due to current climatic conditions. Increasing human population is also causing a strain on agricultural production and urban sewage systems of inadequate capacity. An increase in food demand has lead to more intensive farming practices that require more water and often use pesticides and other soil contaminants that eventually drain into the lake. Increased population has also increased soil erosion that leads to siltation and nutrient enrichment of the lake. Nutrient enrichment of the lake threatens ecosystem structure and function mainly by increasing vegetative growth that leads to degraded water transparency and decreased dissolved oxygen levels. Strangely, the commercial fishery is dependant upon exotic species as there are no native fish species, however overfishing of introduced species are causing an economic threat.  Managing Lake Naivasha (HTML) Case Study. 5/4/2001.  Naivasha Experience Brief. Final. Odada et al. 2/27/2006.  Duker, L. and L. Borre. 2001. Biodiversity conservation of the world's lakes: a preliminary framework for identifying priorities. LakeNet Report Series Number 2. Annapolis, Maryland USA.